Rev. Msgr. 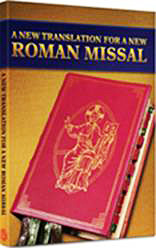 Moroney gives a refreshing introduction to the new English translation of the Roman Missal. In anticipation of the new English translation of the third edition of the Roman Missal, we are pleased to offer a new DVD featuring Rev. Msgr. James P. Moroney, Executive Secretary of the Vox Clara Committee (created by the Holy See in 2002 to advise the Congregation of Divine Worship and the Discipline of the Sacraments on the translation of Roman Catholic liturgical books into English). Msgr. Moroney gives a refreshing introduction to the historical background of the Roman Missal, explaining why these translations are important and how they developed. He also takes an in-depth look at the changes to various Mass prayers, including the Confiteor (“I Confess to Almighty God…”), the Gloria (“Glory to God in the Highest…”), and the Ecce Agnus Dei (“Behold the Lamb of God…”). This DVD is a helpful guide for bishops, priests, deacons, seminarians, and the laity, providing a fertile ground in which to develop a new and insightful appreciation for the Sacred Liturgy and the rich, authentic text of the new English translation, as well as serving as a useful tool for pastoral preparation and catechesis of the lay faithful. Rev. Msgr. James P. Moroney, a priest of the Diocese of Worcester for the past twenty-nine years, is rector of Saint Paul Cathedral and serves as a member of the faculty of Saint John Seminary in Boston. He pursued graduate studies at the Pontifical Gregorian University, the Pontifical Liturgy Institute at Sant’Anselmo, and the Catholic University of America. A past chairman of the Federation of Diocesan Liturgical Commissions, Msgr. Moroney was Executive Director of the USCCB Secretariat for the Liturgy from 1996 to 2007. Pope John Paul II appointed him as a consultor to the Congregation for Divine Worship and the Discipline of the Sacraments, and Pope Benedict XVI reappointed him as a consultor to the Congregation, wherein he also serves as Executive Secretary to the Vox Clara Committee. Msgr. Moroney is a frequent lecturer on liturgical matters, having addressed more than 17,000 priests and deacons in recent years at the invitation of close to one hundred bishops. Msgr. Moroney was a member of the Rome Experience 2009 faculty and taught a liturgy course.